Now what makes a good murder mystery? Is it something to do with the cast of character involved with this tale? Or is it something to do with where this tale is set? Who knows? Maybe Actor / Director: Woody Allen, will, huh? Plus lets not forget Stars: Diane Keaton, Alan Alda, and Anjelica Huston. But only ask them in 1993 and for 104 minutes. Wannabe caterer, Carol Lipton (Diane Keaton), has a very surprising problem to deal with at the moment. No.It doesn't have anything to do with her publisher husband, Larry (Woody Allen). She's used to his funny ways by now. And no. It hasn't got anything to do with Larry's pal, Ted (Alan Alda), either. She enjoys being around him. Instead, Carol is surprised how her elderly neighbour, Paul Homes (Jerry Adler), is behaving after his wife suddenly dies in their apartment. Well, Paul comes across rather happy considering his recent bereavement. Plus he lies about the way that he has buried his wife. And his movements over the following couple of day do appear peculiar to say the least. OK, so what does Carol do about this then, huh? Bake Paul a cake? Yeah. She does that. But she also breaks into his apartment while he away too -- only to discover that he is having a secret liaison with a woman called Helen Moss, whilst using an alias in the process. Oh! Pretty crazy turn of events, I'm sure that you'll agree. Although Larry does feel otherwise -- he's more interested in setting up Ted with one of his authors, Marcia Fox (Anjelica Huston). Whereas Ted on the other hand is very taken by this news -- and he accompanies Carol when she trails Helen Moss to the movie theater which Paul owns. Moreover, some time later, when Larry is prompted to aide his wife as well, they both suddenly spot that Paul's wife is still amongst the living. However, I suppose that is why what next transpires is a right turn up for the books I can tell you. As body's turn up - people have to calm down - ploys play out right - and at the end of the day everybody is left laughing all the way home. Now when I first watched 'Manhattan Murder Mysteries' many a year ago, I can honestly say that I did not like it at all. Well, I just was expecting something else you see, something with a bit more 'Woody' and a little less 'Diane'. However, over the years I have begun to really respect Diane as an actress in her own right, and I do think that in some ways she is a really funny lady, with a very charming way about her. So it is pretty safe to say that upon viewing this comedy / murder mystery this time around, I was rather more compliant with what was on offer. 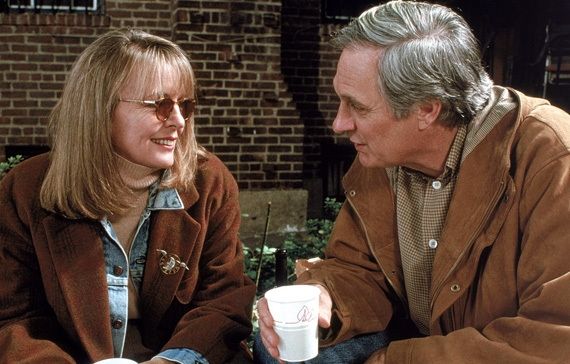 Look at the facts: (1) The lead role was given to Diane Keaton because the actress who was originally assigned to this part, Mia Farrow, divorced the director, Woody Allen. (2) Woody structured this flick on the noir movie series, 'The Thin Man', basing his lead characters on the socialites, Nick and Nora Charles. 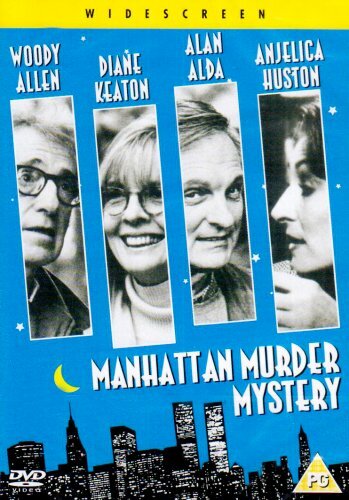 (3) "Manhattan Murder Mystery" was the working title during production, and Woody only decided to keep it when he could not think of anything better to use. (4) There were numerous Hitchcock references through out this movie, such as when Diane's character sees her 'dead' neighbour on the bus; you can see the 'Vertigo banner' on the side. (5) Once Diane became the lead star in this film, Woody rewrote the script to centre the plot around her character more. Please note, Woody says that Diane is funnier than he is. And (6) Woody wanted to make 'Hannah and Her Sisters' into a murder mystery, but decided to remove this sub-plot and make it into its own film - this film. Can you please take note of point six of my fact list -- this movie was initially a plot-strand within 'Hanna and Her Sisters'. Now, if you have watched that great movie as I have, certain nuances in this particular film start to make some sort of sense to me. For example: (1) The love triangle that does not seem to go anywhere. (2) How Woody's character seems to change with the weather depending on what scene he is in. And (3) The way that the overall film does come across fractured in places, as if it were separated by an unseen passage of time. Oh! Please take note again. These statements are not meant to be negative by any stretch of the imagination. No way. Rather, it is an observational incite, justifying why the overall pretext has turned out in the way it has. As for the rest of 'Manhattan Murder Mysteries' on the other hand? Well? I kind of liked it. You see, my personal favorite thing about this film, is how the one-liners keep on whizzing left, right, and centre, throughout this piece -- coming up with some very memorable expressions in the process ('I'm so scared, the blood rushed straight up to my Mother'). Moreover, I really did enjoy watching the main cast on screen together, because Woody, Alan, Diane, and especially Angelica, are a really great quartet, who can convey a two dimensional character in a very three dimensional way. Also, I have to commend how the story dips and parry's from plot to personality, without any seeming jolt in the through-line. Though, if this movie did have a slight lagging part to it, it would have to be how the second-sting characters don't appear to have as much validity as the main players -- seemingly flat in places. Still, this only a minor quibble really, because by in large this is a really fun and enjoyable movie to watch, and I would defiantly recommend it to any fans of Woody, Diane, or mystery buffs, everywhere.